The Weeping Fig Tree, aka the ‘Benji Tree’, is a tropical plant frequently requested by new clients. This is likely due to its widespread use and availability, but this tree seems to have universal appeal. It is available in dozens of varieties and forms. The foliage can be solid light or dark green, or variegated with brilliant white and green leaves. The trunks are often grown in intricate braids and weaves. In ideal conditions, this tree can be straightforward to care for and can live for many years. These conditions include a constant source of very bright, natural light. A south or west unshaded window is almost mandatory in order to have a full healthy tree. Be prepared for a certain amount of leaf loss when the days become shorter and the indoor air dryer. If the tree stays healthy, it will grow new leaves in the spring. Trees from the Ficus family are native to swampy environments and need to be kept moist. High humidity will also make the care of the plant much easier. In dry conditions, this tree is prone to scale insect infestation; you will notice a clear syrupy coating on the leaves, and small brown bumps on the underside of the leaves. If caught early, it can be controlled by simply wiping the leaves frequently to remove the insect. Adjust the watering and humidity. A healthy tree is less prone to disease. Prune the tree regularly to encourage new growth and keep a pleasing shape. Don’t have enough light for this tree? Why not consider an artificial Weeping Ficus? This is one of the most lifelike artificial plants available. Have a look at the attached image. 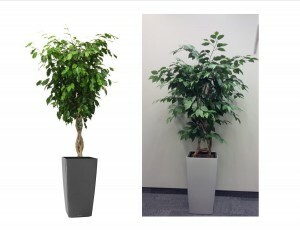 Can you tell which Ficus benjamina tree is real and which is artificial? High quality replica trees are available with real wood trunks and premium silk foliage. They can be custom built to any size and shape. Take the time to find a quality supplier. A well constructed tree will not fall apart, can be cleaned and reshaped frequently without being damaged, and will give you years of enjoyment. A custom manufacturer of replica plants will have many options for containers. The right container suited to the decor of your office will greatly enhance the appearance of the tree. 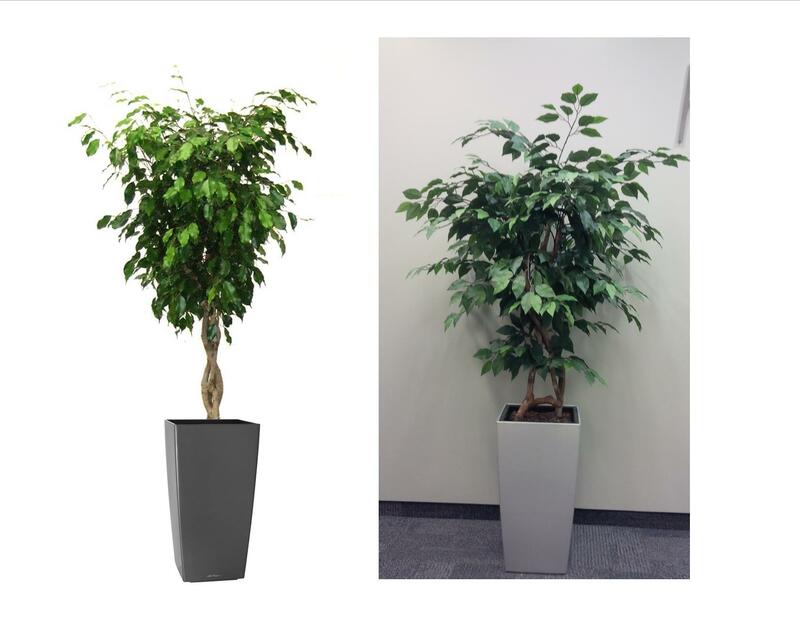 Many offices are choosing artificial trees and plants for their plantscape.